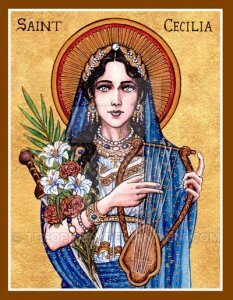 Saint Cecilia, patron saint of musicians. Music is a universal language and the highest form of praise to God. There are many signs and symbols used by the Church to celebrate its faith. Music is an important part of the many celebrations within the church. It enables us to worship God and to express our love for God with our heart and soul as well as our mind. The choir for the 4:00 pm Saturday Liturgy and 9:30 am Sunday Liturgy practices on Tuesday evenings, from October until June, in the church, at 7:00 pm. We would like to invite those who have an interest in leading the music (either by singing or playing an instrument) at the liturgies contact us at 734-246-2999 (Cindy) or music@standreparish.org. Together in Christ we join our voices and instruments, to lead the music during the liturgy, by using the talents we have been blessed with.